How critical is it to know which direction the market is headed? In chapter nine of "How to Make Money in Stocks: A Winning System in Good Times and Bad," William J. O'Neil stated the case bluntly: "You can be right on every one of the factors in the last six chapters, but if you're wrong about the direction of the general market, and that direction is down, three out of four of your stocks will plummet along with the market averages, and you will lose money big time, as many people did in 2000 and again in 2008." Warning! GuruFocus has detected 2 Warning Sign with ATVI. Click here to check it out. C: Current quarterly earnings and sales (the higher, the better). A: Annual earnings increases (watch for significant growth). N: New products, new management, new highs (buy at the right time). S: Supply and demand (shares outstanding plus big volume demand). L: Leader or laggard (which is your stock?). I: Institutional sponsorship (follow the leaders). M: Market direction (how you can learn to determine it). Getting back to market direction, you need a proven and reliable method that will help you determine market direction (bull market or bear market) with confidence. Investors, we know, are continually asking themselves whether the latest dip in prices is a simple correction, say 8% to 12%, or the beginning of a recession. Similarly, is the latest run-up a temporary phenomenon or a bull market taking off? O'Neil said he discovered his method many years ago and it has been a key element in his success. He advised readers that if they understood his method and applied it daily throughout their investing lives, they could avoid serious losses. He wrote, "If you learn to do this well, you should never in the future find your investment portfolio down 30% to 50% or more in a bad bear market." 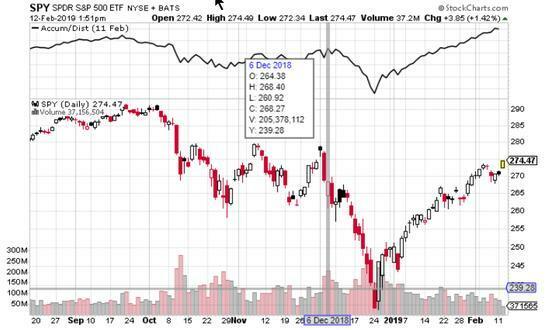 He explained his method this way: "look carefully at, follow, interpret, and understand the daily charts of the three or four major general market averages and what their price and volume changes are doing on a day-to- day basis." From there, O'Neil argued that investors really can time the market. The idea that investors cannot time the market is a "giant myth" promoted by Wall Street, the media and those who have not been able to do it, so they think it is impossible. He said he has heard from thousands of readers who say they have learned how to do it. Further, he argued this erroneous belief, that the market cannot be timed, originated with a few mutual fund managers who were not able to do it more than 40 years ago. Because of an asset size problem and because they had no system, they were late entering the market. They were also relying on gut instinct to tell them when the market had hit bottom and, as a result, waited too long to act. The S&P 500, which is a broader cross-section of the market than the Dow Jones. The Nasdaq Composite is home to the technology sector, and generally home for younger, innovative and faster-growing companies. The Dow Jones Industrial Average (DJIA) is useful for investors who keep their eyes on large, cyclical industrial stocks. For most other investors, it will be far less relevant since it contains only 30 stocks. The NYSE Composite is a "market-value-weighted" index that includes all stocks traded on the New York Stock Exchange. In addition, O'Neil also keeps an eye on volume. As noted in an earlier installment, the most bullish sign for him is a rising price on growing volume, especially if coming up and out of a base pattern such as the cup and handle. Watch the four major indexes listed above. During the uptrend, one of the days will see volume increase from the day before, but the price will stall (a much smaller price increase than the previous day). When this happens on three to six days over a period of four to five weeks, "the general market will almost always turn down." The index prices advance for up to five days, but volume is lower than on previous days. The average price gains little compared with the day before. The market average is not able to regain at least half of its initial drop for it previous intraday high. Of necessity, we did not cover all the methods O'Neil used to determine the direction of the general market. For value investors, the author's ideas may be interesting, but not necessary. It is more important to know your numbers for intrinsic value and margin of safety. If you know those numbers very well, you will be able to hold your stocks with confidence, regardless of the market's direction. If you use O'Neil's approaches, you may face some price dilemmas. Elsewhere in his book, he recommended selling stocks that drop 7% or 8%, but using that criteria in combination with market direction might lead to whipsawing (too much buying and selling because of tight upper and lower price targets).